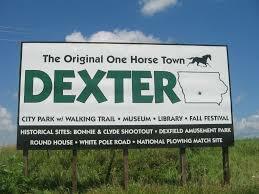 Compassion Builders is located in Dexter, Iowa the original One-Horse town founded in 1868. Located at the edge of Dallas county along the famous White Pole road, it became a doorway to the rest of Dallas county. Dexter has some interesting history in that is was the site where Bonnie and Clyde were recovering in Dexfield Park, when they were ambushed by a posse from on July 24th 1933 approximately 10 months before there crime spree ended. To learn more about Dexter Iowa’s history visit. The photo below is a before image of a garage located in Dexter, Iowa that was in poor condition. The siding was rotted, and the garage doors where in the last of their days. The drive way was pushing water towards the garage causing the front wall to begin to rot. Compassion Builders went to work bringing this garage back to life. We stripped the exterior down to the sheeting and replaced the bottom plate on the front wall. A new Header was installed thanks to the termites that had eaten away the beams center causing it to sag over 2 inches. The second photo above shows what a difference Compassion Builders made during this exterior remodel. A new Jeld wen entry door was installed replacing the broken wooden door. 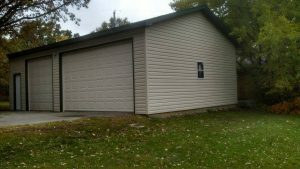 An insulated garage door and new opener will provide a much warmer interior temperature during the winter months. The outside trim was wrapped with aluminum to prevent further rot. 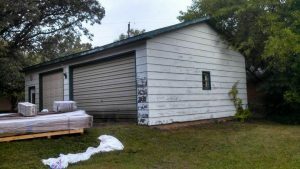 We installed house wrap and CertainTeed Mainstreet vinyl siding to keep the water out and to withstand wind load pressures up to 160 mph. New gutters were installed to direct water away from the building. The end result is a long lasting and low maintenance exterior that will be enjoyed for years to come. Let Compassion Builders be your contractor of choice in Dexter, Iowa for all your Custom home construction and remodeling needs.